Mary Norton (1903-1992) wrote magical children’s books. She is best known for her series The Borrowers, which featured tiny people who live among humans. This five book series ran from 1952 to 1982 and entertained me for many hours. In the first book, The Borrowers (1952), we meet the Clock family who lives under the kitchen floor in an English country home. I was mesmerized and enchanted by their tiny furnishings which they had borrowed from the humans who lived in the house. Thimbles became tables, postage stamps became art to adorn their walls. In the story, they are living a happy life until one of them is spotted by a boy! In The Borrowers Afield (1955), the Clocks have been driven from their home and must take up residence in a boot in the garden. 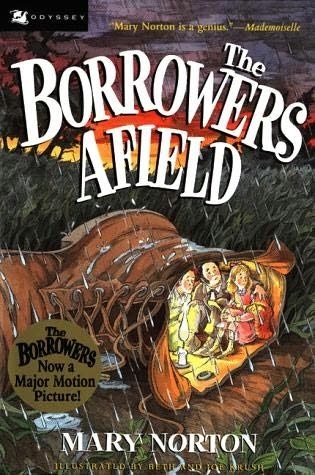 The Borrowers Afloat (1959) find them uprooted, washed down a drain, and living in a teapot in a flood. In The Borrowers Aloft (1961), the tiny family must escape from the human neighbors who wish to steal them and put them on display. And in The Borrowers Avenged (1982), the Clocks take up residence in a church and must continue to escape their captors from the previous book. The main source of conflict in these stories arises from Arrietty, the Clocks’ daughter, and her curiosity about “human beans” and the Big People. Any child (or adult) would love these books! What kid doesn’t dream of a tiny world to discover?! The first book was made into a movie starring John Goodman in 2002. 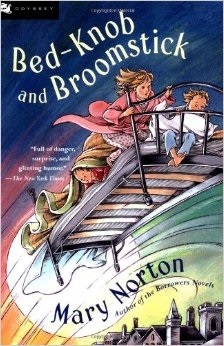 Mary Norton also wrote Bed-Knob and Broomstick, which was a combination of two books, The Magic Bed Knob; or How to Become a Witch in Ten Easy Lessons (1943) and its sequel, Bonfires and Broomsticks (1957). These books weave a tale of the exploits of the Wilson children, Miss Price, the apprentice witch, and a flying bed. It was made into a Disney film starring Angela Lansbury in 1971. 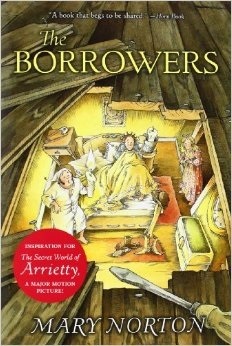 Ms. Norton won the 1952 Carnegie Medal from the Library Association for The Borrowers. In 2007, it was named one of the top ten winning books, proving that some stories are timeless. Will always be one of my favourites. I so wanted to be Arietty when I was a child! Loved Arietty! The whole concept of living with a tiny perspective always intrigued me as a child. Yeah same. I remember wanting to know what it was like walking through an actual doll’s house. Did you see the Studio Ghibli film of Arietty? One of my favourite films ever. Such a wonderful soundtrack too!